Slow but satisfying legal drama. If there is any doubts of George Clooney's acting, this film will put them to rest. This is a tight tense legal drama driven almost entirely by the title character. Micheal Clayton (Clooney) is sentimentally the fixer for a large New York legal firm; A highly skilled lawyer who cleans up messes of other firm members and their high profile clients. Clayton, is not a smooth New York lawyer, rather a disillusioned man up to his eye-balls in debt. However things seem to go from bad to worse after he is asked to clean up an embarrassing incident involving Arthur Edens(Tom Wilkinson), a senior member of the firm, who has suffered a nervous break down. Michael become a target of attacks as he tries to uncover the the truth behind the case Edens was working on. The script is well crafted, making this a slow but satisfying film. 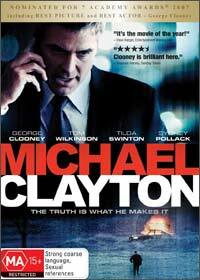 Clooney's acting is fantastic as the title character, he makes Michael Clayton equally skilled and flawed. Clayton is very human he has endearing qualities, which can be seen in his relationship with his son but he is also able to switch to a cold calculating lawyer. The pace of the film can make it tedious however if you are willing to stick with it the conclusion is very rewarding.